Vice Minister of the People’s Armed Forces Col. Gen. Kim Hyong Ryong (left) and Vice Chief of the KPA General Staff Gen. O Kum Chol (right) deliver a floral wreath to Kang Ko’n’s memorial bust at Revolutionary Martyrs’ Cemetery in Pyongyang on June 23, 2018 (Photo: KCNA). 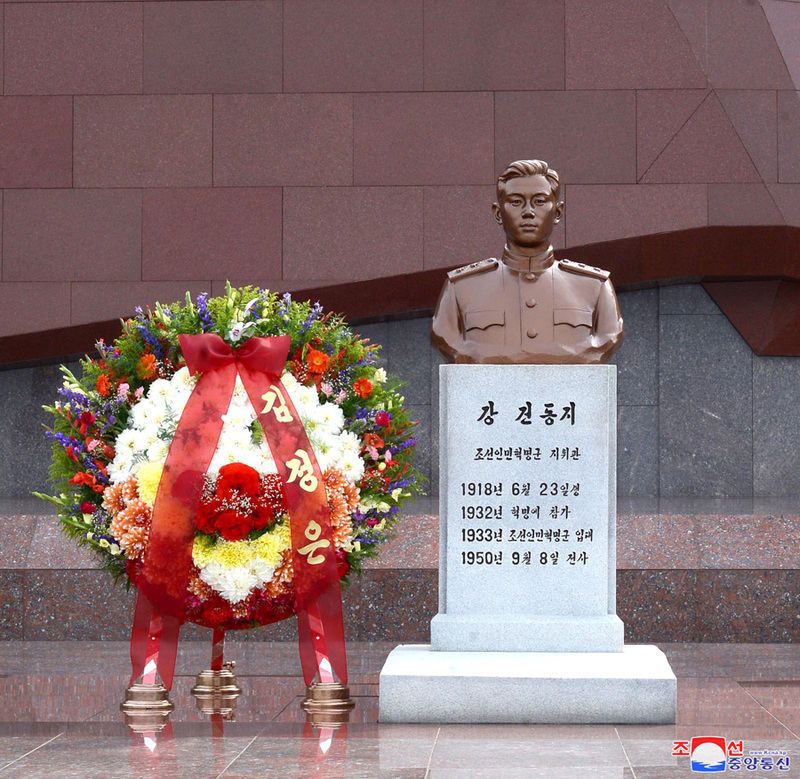 A meeting commemorating the centenary of the birth of Korean People’s Army (KPA) hero Kang Ko’n was held at Central Youth Hall in east Pyongyang on June 22 (Friday). Attending the meeting were Supreme People’s Assembly Presidium Vice President Yang Hyong Sop (Yang Hyo’ng-sop), Workers’ Party of Korea (WPK) Vice Chairman and Director of the WPK Propaganda and Agitation Department Pak Kwang Ho (Pak Kwang-ho), WPK Vice Chairman for Workers’ and Social Organizations and Chairman of the State Physical Culture and Sports Guidance Commission Choe Hwi (Ch’oe Hwi), Minister of the People’s Armed Forces Gen. No Kwang Chol (No Kwang-ch’o’l), DPRK Vice Premier Jon Kwang Ho (Cho’n Kwang-ho), Vice Chief of the KPA General Staff Gen. O Kum Chol (O Kum-ch’o’l), Vice Minister of the People’s Armed Forces Colonel-General Kim Hyong Ryong (Kim Hyo’ng-ryong), Party History Institute Director Ryang Won Ho (Ryang Wo’n-ho) and other senior DPRK Cabinet officials, functionaries and cadres of Pyongyang-based institutions and production units and DPRK citizens who have received state titles and awards. 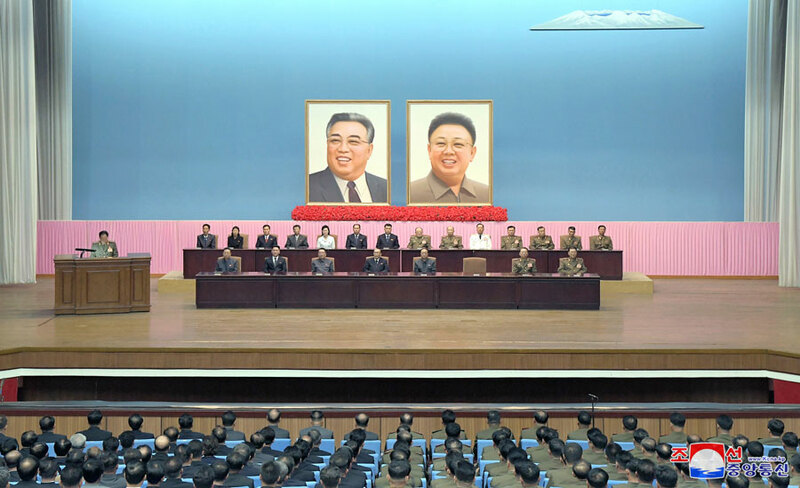 A view of the venue of a central report meeting commemorating the 100th birthday of Kang Ko’n (Photo: Rodong Sinmun). 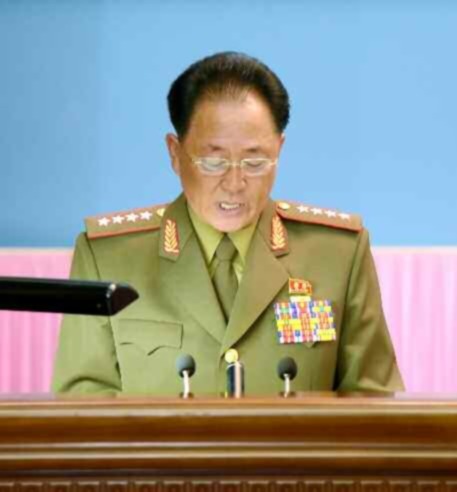 Kang Kon served as a leading official of the Security Cadress’ Central Training School, a Vice Minister of National Defense and Chief of the KPA General Staff. The KPA’s 2nd Infantry Division is named after Kang, along with the Kang Ko’n Military Officers’ Training School in northwest Pyongyang. There is also a statue of Kang in Sariwo’n, North Hwanghae. The Sariwo’n University of Medicine used to be known as Kang Ko’n University until a name change issued by the DPRK Government on October 31, 1990. 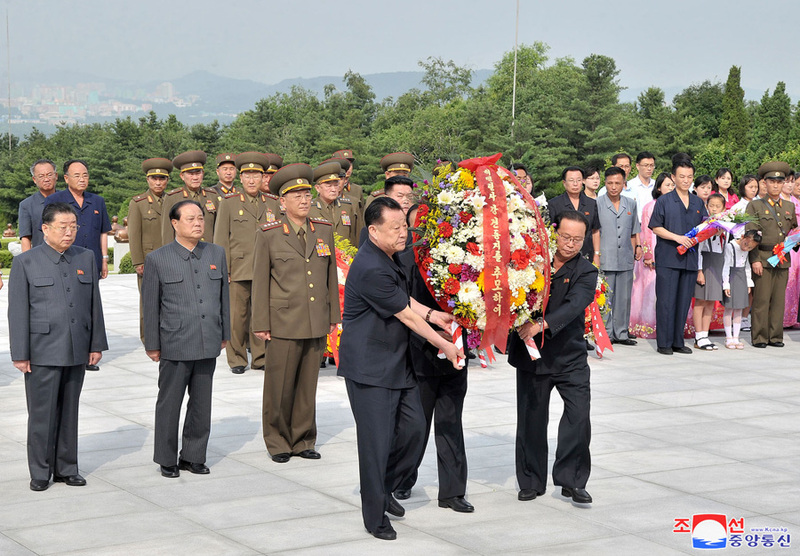 Senior WPK and DPRK Government officials deliver a floral wreath from the WPK Central Committee at Revolutionary Martyrs’ Cemetery in Pyongyang on June 23, 2018 (Photo: KCNA). On June 23 (Saturday) there was a wreath-laying ceremony at Kang Ko’n’s memorial bust at Revolutionary Martyrs’ Cemetery on Mt. Taesong in Pyongyang. 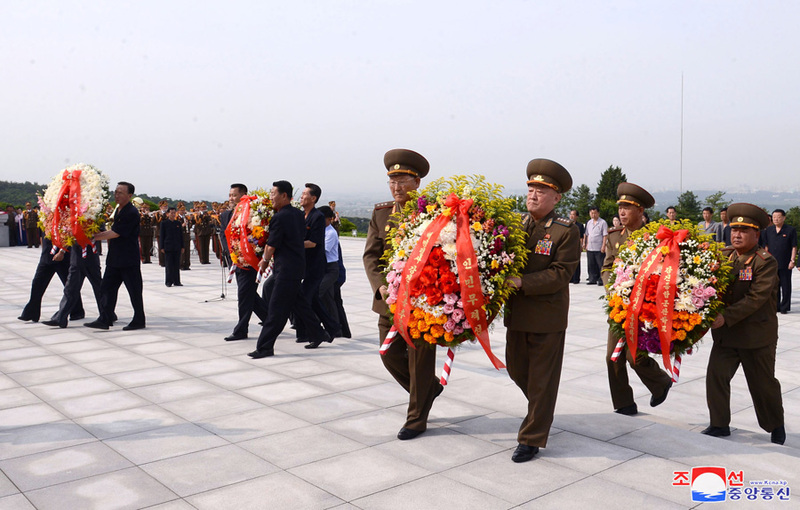 A floral wreath from Kim Jong Un was was delivered to the Kang memorial. Attending the ceremony were Pak Kwang Ho, Jon Kwang Ho, Ryang Won Ho, DPRK Cabinet ministry officials, Pyongyang municipal organization cadres and Kang Ko’n’s descendants. General No Kwang Chol and other leading officials of the KPA high command also came out for the ceremony. A floral basket from Kim Jong Un next to Kang Ko’n’s memorial bust (Photo: Rodong Sinmun). Comrade Kang Ko’n was born into a poor peasant family in Sangju County, North Kyo’ngsang Province, in the time of national suffering after the country had been lost to the Japanese imperialists, and grew up amid all sorts of maltreatment and contempt of the class enemy. Unable to continue to put up with the violence and cruelty of the Japanese imperialist aggressors and landlords, Comrade Kang Ko’n moved to Ningan Prefecture in North Manchuria, a foreign land, with his parents at the age of 10. Even there, he could not escape the wretched fate of colonial slaves and lost his parents and siblings to their brutal atrocities. Comrade Kang Ko’n, who embarked upon the road of revolution after experiencing the life of the Children’s Corps, threw himself into the armed struggle against the Japanese imperialists, upholding the great leader Comrade Kim Il Sung’s lines of the anti-Japanese armed struggle, and joined the Anti-Japanese People’s Guerrilla Army in April of Chuch’e 22 (1933). Comrade Kang Ko’n, who came to have the honor of being a member of the party organization thanks to the deep trust and particularly profound loving care of the great leader, was made a platoon leader and rose to the rank of a company political commissar, a regiment political commissar, and a political commissar of a detachment, thereby contributing to expanding and developing the anti-Japanese armed struggle and to winning shining victory in it. In the days of building a new country, Comrade Kang Ko’n, holding such important posts as chief of Camp No 2 of the Security Officers Training Center, vice minister of National Defense, and concurrently chief of the General Staff of the Korean People’s Army, devotedly struggled, faithfully upholding the great leader’s idea of building a regular revolutionary army and his leadership. He made a great contribution to the victory in the war during the days of the hard-fought Fatherland Liberation War as chief of the general staff of the command of the front by devoting all his wisdom and energy to implementing the strategic and tactical policy of the comrade supreme commander. Comrade Kang Ko’n, who had resolutely fought for victory in the revolution, crossing countless hills of bloody battles under the gunfire of the grave revolutionary war, died a heroic death on the battlefield at the age of 32 on 8 September, Chuch’e 39 (1950), while commanding an offensive operation of the KPA units to wipe out the US imperialist aggressors. Comrade Kang Ko’n’s life was short, but it was a valuable one that set a practical example of showing how a genuine revolutionary and a passionate patriot should uphold his leader and live and fight for the fatherland and people. Comrade Kang Ko’n was a true chuch’e-type revolutionary who resolutely defended and implemented the leader’s idea and lines, orders, and instructions, with boundless loyalty to great leader Comrade Kim Il Sung. Comrade Kang Ko’n, who ardently admired the suryo’ng as he drank in the legendary tales about General Kim Il Sung, the sun of the nation, from the days he spent in the Children’s Corps, came to feel his heart warm about the lofty mettle of the leader after seeing a performance given by the Children’s Corps art squad dispatched to Northern Manchuria by the leader and hardened his determination to mow down the Japanese imperialists to liberate the fatherland at any cost. Comrade Kang Ko’n met great Comrade Kim Il Sung for the first time in October, Chuch’e 23 (1934), when the latter had embarked upon his first expedition to northern Manchuria to expand the flames of the anti-Japanese revolution to a broader region and received programmatic guidelines from him. This was a phase of a new turn in Kang Ko’n’s revolutionary struggle and life. Looking up to the great leader who was brightly illuminating directions and ways for strengthening and developing the units operating in the northern Manchuria and for the struggle they were waging, Comrade Kang Ko’n deeply realized that Comrade Kim Il Sung was really the outstanding leader, the lodestar of national liberation, and the sun of the nation to guide the anti-Japanese armed struggle along the single-track road to victory and came to cherish a rock-firm faith that the Korean revolution would triumph without fail when the leader’s revolutionary lines and policies are thoroughly implemented. While meeting with Comrade Kang Ko’n, the great leader heard from him how he had come to throw himself into the revolution, praised him for discharging the duty of a platoon leader at a young age, calling it really heroic, and gave him valuable teachings that people should regard as lifelong guidelines as revolutionaries, including the need to achieve ideological and volitional unity based on the revolutionary camaraderie within the guerrilla ranks and principled issues arising in strengthening the ties with the people. Completely fascinated by great Comrade Kim Il Sung’s uncommon intelligence, far-sightedness, and distinguished personality, Comrade Kang Ko’n devoted everything he had to fighting on the single-track path of the revolutionary, led by the leader. Although he carried out his activities independently of the headquarters for a long time in the days of the anti-Japanese armed struggle, Comrade Kang Ko’n was consistent in his attitude and position of holding great Comrade Kim Il Sung in high esteem as the leader of the revolution. Comrade Kang Ko’n’s boundless loyalty to great Comrade Kim Il Sung was highly displayed by the fact that he regarded arming himself firmly with comrade commander’s revolutionary idea and lines, and thoroughly defending and implementing them, as the fundamental issue on which the destiny of the revolution depended, and carried out a stubborn struggle. During the anti-Japanese armed struggle period, Comrade Kang Ko’n constantly carried in his backpack the great leader’s works, such as “Duty of the Korean Communists” and the 10-point “Programs for National Liberation”, and studied them during short breaks between marches or under the campfire at billeting areas, making sure that all of the members mastered the chuch’e-oriented revolutionary lines and policies put forward by the suryo’ng by establishing a revolutionary study habit within the units through his practical example. His firm will and faith to bring the Korean revolution to conclusion with the gun barrel, by faithfully upholding the great leader’s idea and leadership, is vividly engraved in the lyrics “Ranks of Steel” that Comrade Kang Ko’n composed during the days of the anti-Japanese armed struggle. Armed with such clear-cut faith and will, Comrade Kang Ko’n waged an intransigent struggle against any tendency running counter to the comrade commander’s idea and intention, however trifle it may be, under any circumstances. It was when the suryo’ng put forth a new strategic policy on breaking up the fixed guerrilla zones in line with the changed situation and the progress made in the anti-Japanese armed struggle and making the Korean People’s Revolutionary Army [KPRA] units advance to broader regions and organize and wage large-scale guerrilla warfare there. Under the conditions where the Japanese imperialists frantically carried out large-scale punitive offensives against the guerrilla bases with the mobilization of vast armed forces, while launching all sorts of pernicious propaganda and viciously maneuvering to disintegrate the guerrilla zones from within, even going to the length of employing defection-inducing operations, adhering to the fixed guerrilla zones alone could not only result in failure to preserve the revolutionary forces, but also put the KPRA on the defensive. However, the factionalists completely infected with flunkeyism and left adventurists stubbornly insisted on sticking to the guerrilla zones and, in the end, persistently maneuvered to force down their wrong argument on others, even using by stealth the signboard of the international party. Ardent revolutionaries, including Comrade Kang Ko’n, smashed their counterrevolutionary maneuvers by waging an intransigent struggle at the risk of their lives and safeguarded and implemented comrade commander’s idea and intention to make inroads into broader regions to wage large-scale guerrilla warfare through to the end. Throughout the whole period of the anti-Japanese armed struggle, Comrade Kang Ko’n upheld in his heart the lines of the anti-Japanese national united front and the lines of the anti-imperialist joint front put forward by the suryo’ng, hardened the chuch’e-oriented forces of the revolution by explaining and instilling them into guerrilla members and vast masses, and greatly contributed to expanding and strengthening the anti-imperialist revolutionary forces by consistently conducting the work with the Chinese people’s anti-Japanese units. Comrade Kang Ko’n did not tolerate even an inch of deviation when it came to the execution of the great leader’s orders and directives. Accepting the great leader’s orders and directives as the paramount duty and demand of life, and thoroughly implementing them unconditionally, was the ideological and mental characteristics that ran through the life of Comrade Kang Ko’n. Maintaining normal ties to the headquarters, Comrade Kang Ko’n received strategic and tactical policies freshly put forward by the great leader in a timely way and thoroughly implemented them. When he received an order from comrade commander on changeover from small-unit activities to large-unit activities in accordance with the policy adopted at the historic Xiaohaerbaling Meeting in the days of the anti-Japanese armed struggle, Comrade Kang Ko’n carried out a march of some 1,000-ri from Baomadingji, Liaohe Prefecture, to Jiamusi, Baoqing Prefecture, leading a small unit, dealt a profound blow to the enemy by actively conducting military and political activities, and positively encouraged the anti-Japanese struggle waged by the Korean and Chinese people. While working as commander of the Jidong subdivision in the days that followed the national liberation, upholding the great leader’s order that the units operating in the border areas help the fraternal Chinese people’s revolutionary struggle, Comrade Kang Ko’n took part in numerous battles for the liberation of the northeast region, thereby setting a living example of internationalism. In the days of building a new fatherland, he Kang Ko’n put in a nation-building room, a lecture room, a training ground, and an infirmary by his own effort within a short period of time by working day and night to fulfill his heavy duty to organize Camp No 2 of the Security Officers Training Center, upholding the great leader’s chuch’e-oriented army-building line. This clearly shows the high sense of responsibility and devotion with which Comrade Kang Ko’n thoroughly executed the leader’s orders and instructions, going through water and fire. Indeed, Comrade Kang Ko’n’s traits as an indomitable revolutionary who, with boundless loyalty to the great leader Comrade Kim Il Sung, regarded the leader’s revolutionary idea and lines, his orders and directives, as absolute and implemented them without condition, serves today as an excellent model for our army and people who are racing ahead like a gale toward the pinnacle of a powerful socialist state with the burning flames of a great new revolutionary upswing. 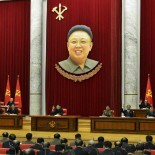 Comrade Kang Ko’n was a talented, extraordinary military commander armed with a military eye and commanding art. Having great trust in him, the great leader paid special attention to training Comrade Kang Ko’n, who appeared to be quick and bright as an able military commander. During his first expedition to northern Manchuria, the great leader carried out vigorous military and political activities for months in a bid to create conditions favorable to the inexperienced units operating there so they could control the enemy and vigorously carry out guerrilla battles, and during those days he taught the platoon led by Comrade Kang Ko’n a variety of superb tactics, including tactics of allurement, ambush, and pincer tactics, keeping it within reach, so that he could superbly fulfill his duty as a platoon leader. Even in the ensuing days, the great leader, not forgetting about Comrade Kang Ko’n who was fighting in distant northern Manchuria, informed him of new strategic and tactical methods of the revolution he had put forward and sent him even a copy of a new book, Guerrilla Movement, he had written. Comrade Kang Ko’n made tireless efforts to master the great leader’s gifted military resourcefulness and superb art of war and achieved brilliant war results in every battle he fought by actively applying them to military activities. In the latter half of the 1930s, Comrade Kang Ko’n set up his base of operations in the Mt Laoning ranges, flogged the enemy in a flash in mountains and open areas on both sides of Mudanjiang River, and dealt huge blows to the Japanese imperialist aggressors by skillfully organizing and commanding many battles, such as surprise raids and battles of wrecking railway bridges, roads, and magazines, in many parts of the region. In a battle of raiding a military train at Xinjiadian section of Mujia Line carried out in December, Chuch’e 30 (1941) alone, Comrade Kang Ko’n made the enemies shudder by overturning two cars carrying Japanese imperialist army officers and a number of cars laden with armored vehicles and gasoline. Comrade Kang Ko’n, a talented military commander, brought forth a large number of able-bodied military functionaries by devoting his wisdom and energy to training them while discharging his duty as a responsible person at the training camp of security officers in the post-liberation days and, after assuming a heavy responsibility as the chief of the KPA general staff, he devoted himself to strengthening our party’s regular armed forces politically and militarily as intended by the great leader, thereby making a great contribution to the building of revolutionary armed forces of chuch’e. Comrade Kang Ko’n’s military qualities and ability to command were highly displayed during the arduous period of the Fatherland Liberation War. Upholding comrade supreme commander’s order to immediately switch over to a counterattack in preparation for the enemy’s surprise invasion, Comrade Kang Ko’n liberated Seoul with one rush by swiftly organizing and commanding the people’s army units advancing in the forefront with a high spirit of exterminating the enemy and successfully guaranteed the battle for the liberation of Taejo’n, which the enemy boasted of being an unbeatable line, by applying the plan of military operations put forward by the leader. This shows that Comrade Kang Ko’n was a military commander well versed in modern war methods. Thus, the meritorious services in struggle rendered by Comrade Kang Ko’n, who made an extraordinary contribution to the long bloody battle for consummating the Korean revolution pioneered on Mt Paektu with the gun barrel through his dedication of wisdom and energy, are etched in the history of the military-first revolution of chuch’e, which has won victory after victory in the course of defending the freedom and independence of the fatherland. Comrade Kang Ko’n was a distinguished commander of the revolutionary army who had a high sense of organization, sense of discipline, fidelity to the revolutionary principle, and ardent spirit of serving the people. Comrade Kang Ko’n, who embarked upon the road of struggle early on with clear-cut class consciousness, which had been raised through the revolutionary organization, regarded the organization as precious as life, endlessly disciplined himself through organizational life, and stringently demanded that strong revolutionary discipline and orderliness be established within the unit. In addition, he never made any concessions, even the slightest ones, when it came to the revolutionary principles and did not tolerate anyone who violated the revolutionary disciplines, even if they happened to be his beloved flesh and blood. Comrade Kang Ko’n, who was honest and sentimental, modeling himself on the great leader’s lofty revolutionary traits and virtues, treated his members as precious revolutionary comrades and as his own flesh and blood, with whom to share the same fate, and fought to defend the people’s interests, lives, and properties at the risk of his life, as if they were his own. In the Daitunggou Battle in Chuch’e 25 (1936), he led the enemy out to a spot far from the village to keep the people from danger, in spite of the very unfavorable situation, and wiped them out. This was a lofty expression of the popular traits of Comrade Kang Ko’n, who fought with a firm conviction that the revolution was for the people. Even in the arduous struggle of plowing through a sea of blood, Comrade Kang Ko’n fully exhibited the noble traits of the KPRA, which always thoroughly defended and protected the lives and property of the people and regarded the people’s interests as precious as its own life. Because of it, people respected and loved it. Thanks to the laudable virtue of the unity between officers and men and the solidarity of the army and people highly displayed by such excellent commanding officers as Comrade Kang Ko’n under the leadership of the great leader, our revolutionary armed forces came to achieve firm unity on the basis of the revolutionary sense of obligation and comradely love, came to enjoy the people’s wholehearted support and backing, and won eye-dazzling victories in the hard-fought anti-Japanese armed struggle and the Fatherland Liberation War. Comrade Kang Ko’n’s life was indeed a shining life lived by an indomitable revolutionary who single-mindedly devoted everything to fighting for victory in the chuch’e revolutionary cause with the gun barrel under the leadership of the great leader Comrade Kim Il Sung. Upon hearing the unexpected, tragic news that Comrade Kang Ko’n had died in action at the front, the great leader was filled with deep sadness, saying that the former had fallen in action in a place not far from his native village. At his funeral, the Suryo’ng was in the first row of those carrying the casket for the burial. Highly appreciating his meritorious military service, the great leader made sure that the title of Hero of the Republic was awarded to Comrade Kang Ko’n, and the First Central Military Academy was named after him, and in his reminiscences he highly mentioned his life and feats, noting that he dedicated even his last drop of blood to the revolution and performed great exploits in the field of building the people’s armed forces. This article was written on 27 Jun 2018, and is filled under Central Party Affairs/Cadres 5th Section, Choe Hwi (PAD], Col. Gen. Kim Hyong Ryong, Col. Gen. O Kum Chol, DPRK Cabinet, Executive Policy Bureau, Fatherland Liberation War (Korean War), gsd, Ideological Works, Jon Kwang Ho, Kim Family, Kim Jong-un, KJI Personal Secretariat, Korean People's Army (KPA), Korean Workers' Party (KWP), KPA General Staff, KPA Party Life, KPA supernumerary organizations, KPA WPK Committee, Lecture Guidance, Ministry of the People's Armed Forces (MPAF), North Korean press, Organization and Guidance Department, PAD Guidance Section, Pak Kwang Ho (PAD), Party elders, Party History Institute, party life, Political Bureau, Propaganda and Agitation Department, Provincial Party Committees, Provinicial People's Committee, Public Events, Pyongyang City People's Committee, Pyongyang WPK Committee, Ryang Won Ho (PHI), State Affairs Commission, Supreme People's Assembly, Uncategorized, Workers' and Social Organizations, Yang Hyong Sop.